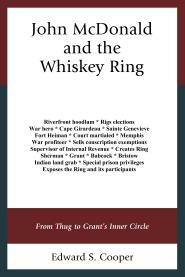 Thank you to the good people at Farleigh Dickinson University Press and Rowman & Littlefield for providing a complimentary copy of John McDonald and the Whiskey Ring: From Thug to Grant’s Inner Circle written by Edward S. Cooper. Cooper is the author of The Brave Men of Company A: The Forty-First Ohio Volunteer Infantry (2015) and Louis Trezevant Wigfall: The Disintegration of the Union and Collapse of the Confederacy (2012). Details: 195 pages including index, bibliography, and notes. ISBN 9781683930129. $75.